A Rose for Emily symbolism research papers examine the instances of symbolism that occur in William Faulkner's short story. Symbolism is an important literary element in nearly every great piece of American Literature. Paper Masters will custom write a research paper on symbolism in A Rose for Emily and explain the most important parts of the story that William Faulkner reveals through symbolism. Second, the theme of dust pervades the story. Faulkner not only describes the men of the town sprinkling lime dust around the property in order to mask the mysterious odor, but the image is laid of a house becoming overtaken with dust. The house is “filled with dust and shadows” and the upstairs bedroom, when the door is broken down, is filled with “pervading dust.” Dust not only represents death, but also provides further symbolism of a culture that can only be preserved like an abandoned museum. Finally, there is the gray hair. Miss Emily’s hair is described as going iron-grey and remaining unchanging, as if she wished to be frozen in a moment of time. The single gray hair on the pillow speaks to the determination of this woman to freeze a moment of embrace with her lover. Southern Gothic Literature Research papers and essays on Gothic literature in the South. 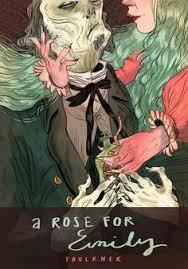 A Rose for Emily Character Analysis term papers analyze one of William Faulkner’s most enduring short stories. William Faulkner's A Rose for Emily is a story about the main character Emily’s life, which is symbolic of constant change and the fear of embracing change. A Rose for Emily Theme research papers discuss the main themes of tradition and change, and death and how these two things have impacted the main character of Faulkner's short story. A Rose for Emily Summary and Analysis project, William Faulkner's short story and examines his unique story telling method. A Rose for Emily Analysis looks at the main character and discusses Faulkner's approach of story telling. Order a research paper on A Rose for Emily from Paper Masters. Foreshadowing in a Rose for Emily Book Reports on Faulkner's Famous Short Story. Paper Masters writes custom research papers on A Rose for Emily Symbolism and examine the instances of symbolism that occur in William Faulkner's short story.